I wouldn't expect, that the first captured image in the attachment area (sometimes) becomes the thought icon. I realized this only, after I wondered twice where a captured image had gone, because it didn't appear in the attachment area. PS: This issue even goes deeper. Sometimes I don't want the first captured image become an icon (and I don't want to paste it in the notes). Thanks so much for pointing out these inconsistencies! This has been a frustration for me, as well. In addition, I sorely miss the option of capturing an image of my notes. Haven't found any way to do this in TB10 without adding the image as a thought icon -- which is never the intended objective (for me) when capturing this type of screenshot. Are you using Windows? 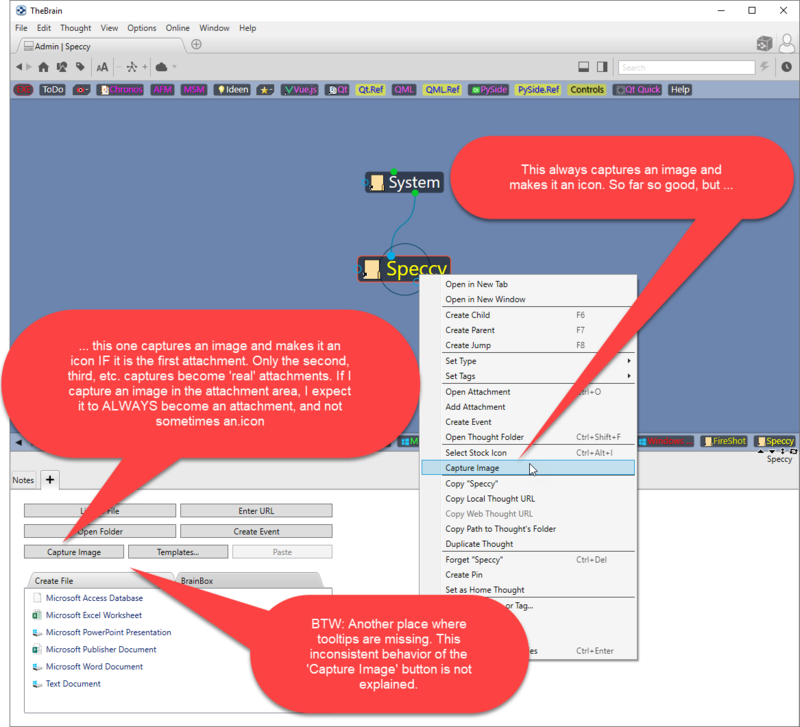 If so, you can capture notes as an image by using WIN + Shift + S. Then you can select a region. The clip is put into the clipboard. From there, the usual options hold... (Insert by Crtl + V, anywhere). My current solution is simply to use the screen capture tool in TB8 (the current home for all my working brains) -- or, if push comes to shove, there's always the Windows snipping tool. It would just be nice not to lose this convenient (built-in) functionality from TB8 when I (eventually) migrate from TB8 into TB10.